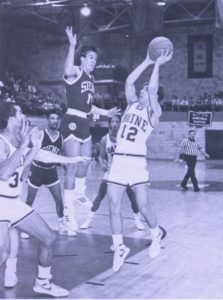 Matt Rossignol is a Maine high school legend as this high scoring, high- octane performer delighted hoop fans during his entire playing career. Rossignol, who played for Van Buren High School, scored 2,257 points in his high school career, and tossed in 51 in the 1985 Eastern Class B semifinals against Schenck of East Millinocket. That year he set two regional records that still stand: points (103) and field goals (37). After high school, Matt attended the University of Maine where he played for Hall of Famer Skip Chappelle. While at Maine, he scored 1,297 career points. He also had a big hand in perhaps the program’s signature victory, an 84-81 win over Michigan State in 1986 at the Auditorium. He scored 23 points, hitting 5 of 9 3-point shots. Matt has coached at the high school level for over twenty years.